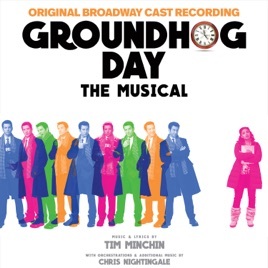 Translating a movie as beloved as *Groundhog Day* to the stage is no easy feat, but the cast here is in capable hands: The show’s music and lyrics are by Tim Minchin (who won a Tony Award for *Matilda The Musical*) and the book is by Danny Rubin (who cowrote the movie’s screenplay with the late Harold Ramis). Together, Minchin and Rubin explore the movie’s premise—a weatherman relives the same day, over and over again—with inspired new depth, giving side characters like Ned Ryerson center stage (the stirring ballad “Night Will Come”), while broadening the emotional range of leads Phil Connors (the Queen-like ballad “Hope”) and his love interest, Rita (the funny, touching “One Day”). If you loved Matilda, you're going to LOOOOVVVEEE Groundhog Day. It's Minchin on a WHOLE new level. Tim Minchin's a genius - he never disappoints. So, so good. I've been excitedly anticipating this album since I heard Tim Minchin's rendition of "Seeing You" at a live show a few years ago. I have to say, it exceeds even my highest expectations! This album is full of witty lyrics and singable tunes. WARNING: The orchestral scores and choral melodies may make you cry in public... in a good way. It is unfortunately going to be awhile before I can see the show live, but I'm very excited to have the cast album to tide me over until then. I absolutely recommend this album for anyone who... actually, just anyone.